Through my nostalgic quest to uncover and revisit as many 80s customs as possible, I have been given various ‘leads’ over the years. Many of those come to nothing more than a rusty pair of legshields or a mutilated panel at the back of a shed, but every now and then a ‘gold nugget’ appears. A couple of months ago, after receiving such a lead, I contacted a lad called James Taylor. 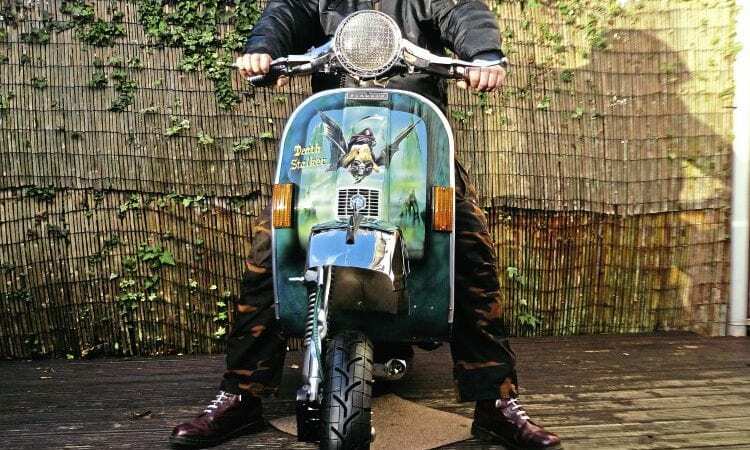 He told me he had several 80s style Vespas in his garage, including a little-known Spurgeon fantasy art themed scooter called ‘Death Stalker’. 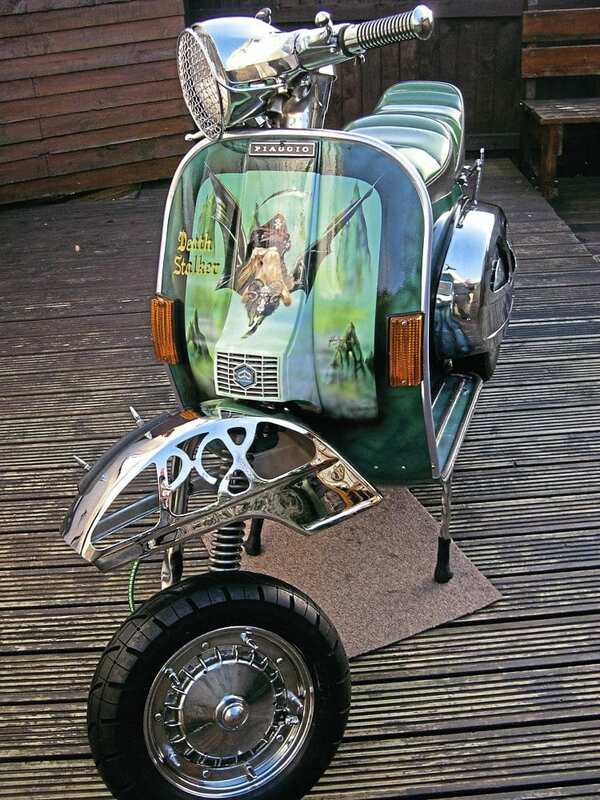 For me this sums up late 80s scooterboy customising – fantasy art done by, at the time, one of the best in the business. 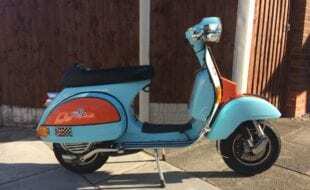 Plus candy paint, chrome, extended forks, loud pipe, and P2 reliability! 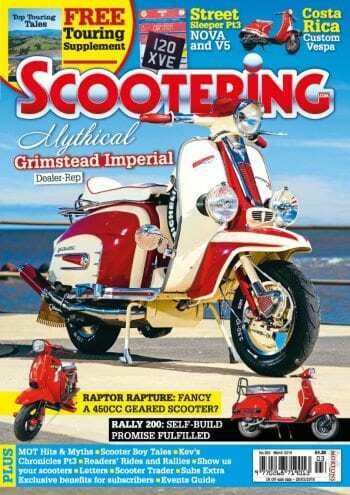 What more could an 80s scooterboy ask for? 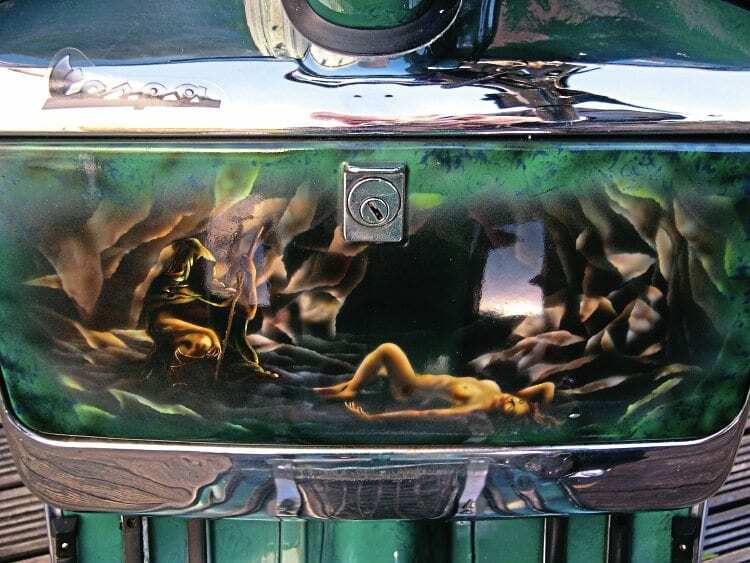 Year originally built: Out of factory in 1983 and then custom painted in 1987. Fabrication: It was built in 1987 by previous owner, various parts changed over the years by myself. 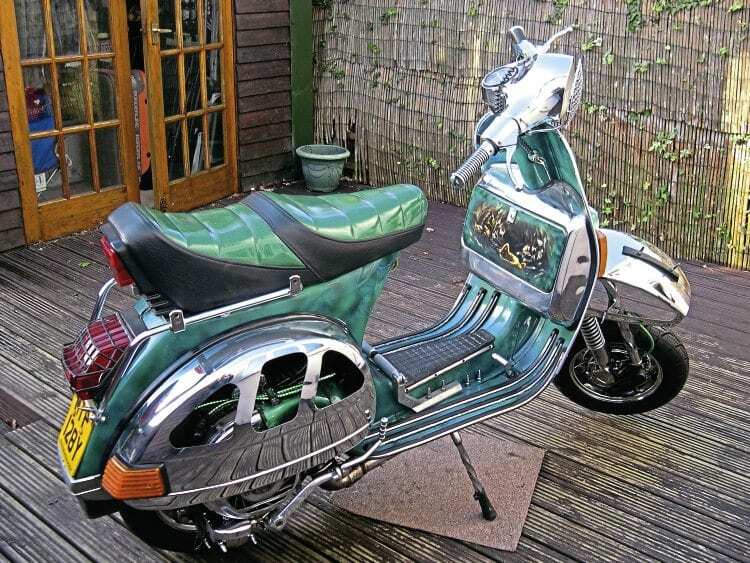 Extended forks, changed mudguard over and other various small bits. Chrome/engraving: Various parts picked up off my mates, parts fairs and eBay. Are you the original owner or when did you become: I became the owner in 1996. When you got the scooter what condition was it in: The scooter wasn’t in too bad a condition when I bought it, apart from the dog teeth marks! 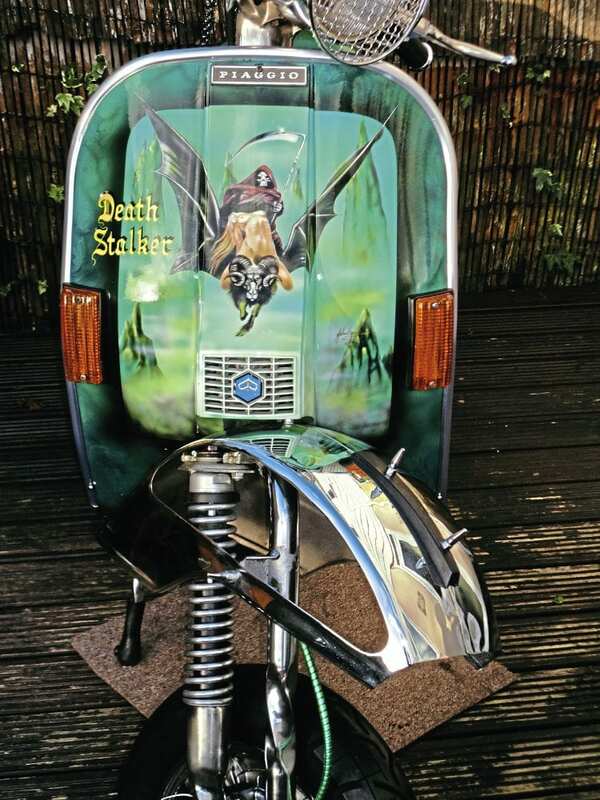 The guy had a big German Shepard and it had chewed a fair bit; wheel cover, seats legshield beadings, plastics and even the original chrome mudguard! 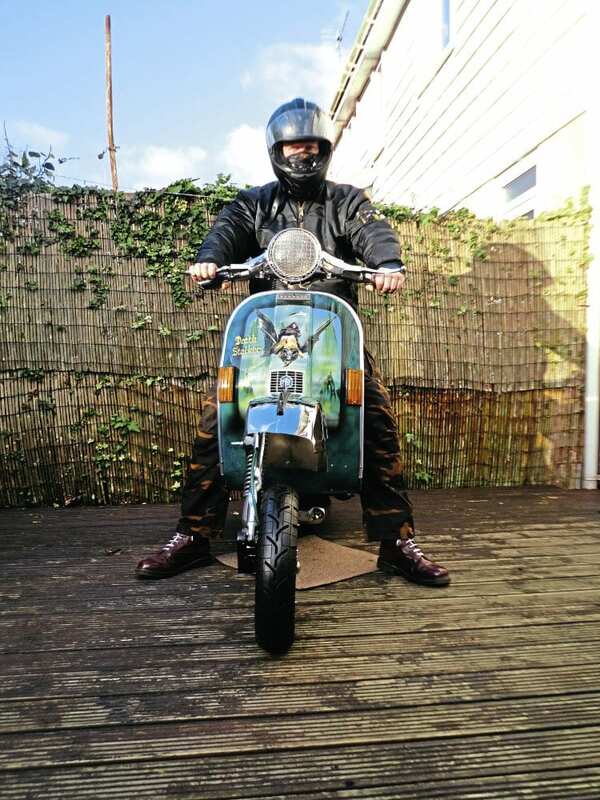 What have you had done to it or plan to do since owning: I have only changed a few things, mainly cosmetics – mudguard, forks, the usual stuff as time took its toll on chrome, etc. Do you still do rallies: Yes, but now just the more local ones – Weston, Exmouth and Tenby. 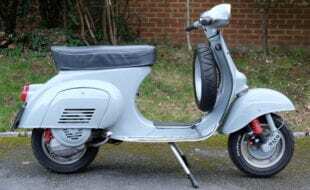 Funny stories either about a scooter or you at rallies (80s-90s): I remember breaking down on my way home from Southport in 1993. I was about 50 miles from home with no AA cover. Luckily I had my good old friend Jerome Reed with me, these days known as the master mechanic and owner of Reedspeed Scooters! 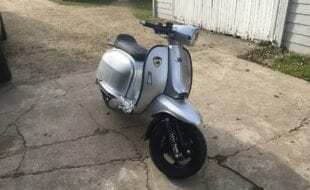 So Jerome’s plan was to tow, but who takes a tow rope on a scooter? As necktubes were in we had no scarves to use either! 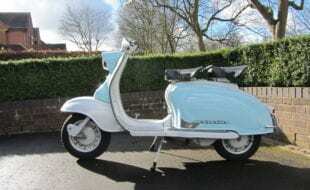 So the plan was I would run with the scoot to get it moving, jump on and Jerome would pull alongside me with his left arm hanging back so I could grab it with my right. Unbelievable I know, as my mudguard was basically touching the rear of his panel. This was the most bum clenching ride of my life as we had to ride through A-roads, down lanes, up hills/down hills you name it, only stopping now and again to rest our limbs as Jerome relentlessly wanted to get home. I was so glad that programme wasn’t on telly – Caught on Camera, with motorists doing silly things! All I can say is thanks for the tow Jerome, and sorry to the van loads of football supporters shouting abuse at us when we pulled over on the A449 to have a rest. It was here we realised it was coned off to one lane, and we had caused about a 10 mile tailback! Favourite event ever: Weston-super-Mare, always good. 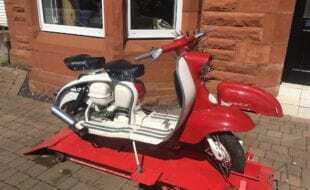 Favourite dealer: Used various over the years, now Welsh Scooter Parts as they are local. 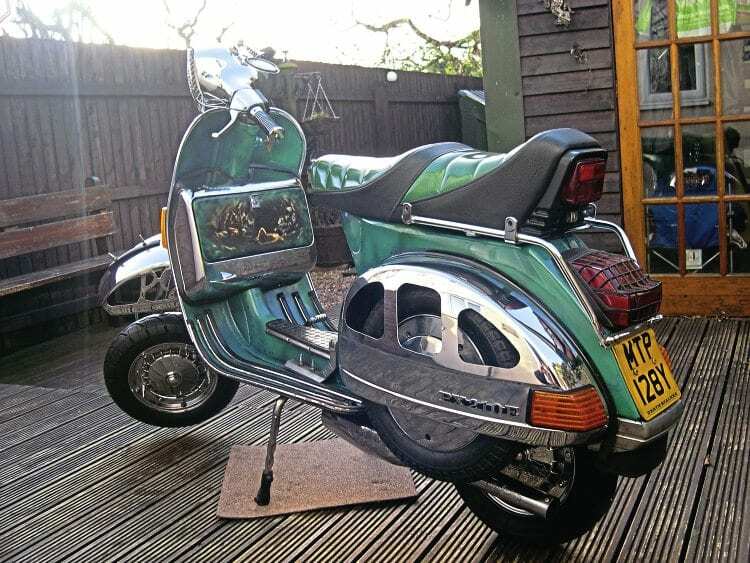 Anything else you’d like to add or think is relevant: When I first saw this scoot in 1989 I thought I it was the best scooter I had seen. 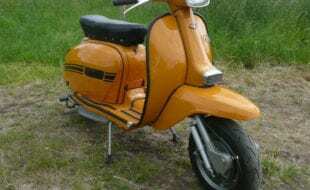 When you’re 17 years old you always get a picture in your mind what your perfect scooter is and for me this was it. Fast forward seven years and I’m over Taffspeed and spot an advert on their notice board. 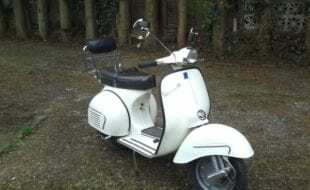 The rest is history, I picked It up for just £500 – I didn’t even haggle; 1996 must have been a good year for cheap scooters! 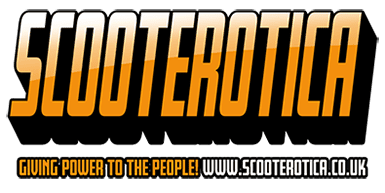 Preservation tips to keep the scooter in good condition/etc: Keep away from canines!